Every in-house marketing department has times when work gets out of hand—when people quit, take time off, or just don’t have the skills you need. When management piles on assignments or projects collide. 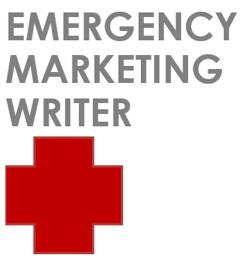 I specialize in adapting quickly to your voice, product and industry: senior marcom writing on demand, without a lot of hand-holding, when you need it most. It’s the season for annual reports, marcom’s most important project. Careers have been made and broken on the merit of annual reports, because they are judged by your most important audiences. Let me fix grammar, clarify ideas and strengthen language, so both you and your company look good. Connecting with audiences entails more than words strung together. To make an impact, you need to incorporate empathy, surprise, inspiration and credibility. I’ve written speeches for Nebraska’s governor, top executives and politicians. Let me help you say what you mean, clearly and powerfully. Writing a non-fiction book about your specialty is a powerful way to build credibility and open doors like nothing else can. Fortunately, it’s easy these days to publish. It’s the writing and marketing that’s difficult. I can turn the book you’ve been thinking about into a reality through ghostwriting or editing. Travel writing: Join my adventures as a solo woman frugal traveler and on-the-road business writer! Look for kindrafoster on Instagram, visit Roadworkwriter.wordpress.com, or “like” Foster Executive Writing & Editing on Facebook.